Non-consumptive recreation refers to activities such as beach going, whale watching, photography, surfing, scuba diving, and boating, in which participants do not remove resources from the ocean or coast. A web-based survey conducted in 2013 found that coastal and ocean recreation encompasses a popular and diverse group of activities in the Mid-Atlantic, resulting in economic and social benefits to coastal communities (U.S. Mid Atlantic Coastal and Ocean Recreation Study). Survey respondents who visited the Mid-Atlantic coast in the prior year spent an average of $71 per trip. The survey, launched in July 2013 and ending in December 2013, found that over the previous year beach going, scenic enjoyment/sightseeing, and biking or hiking were the top three most popular activities among survey respondents. Survey respondents identified over 22,000 locations where they had enjoyed non-consumptive recreational activities in the Mid-Atlantic region. Coastal tourism and recreational economies are dependent on the environment, natural resources, and public perception of the area. In 2012, the tourism and recreation sector of Mid-Atlantic counties supported more than half a million jobs and produced $27.4 billion in GDP (NOEP 2015). This sector’s employment increased by more than 65,000 jobs since 2005 (NOEP 2015) and is projected to grow with a strengthening economy. A complete economic analysis of non-consumptive recreation would also account for the cultural and social values that people attribute to coastal and ocean areas. Although these non-market values have not been studied at the regional scale, several studies have been conducted at smaller scales in the region. For example, a study of Delaware beaches found that if beaches were allowed to narrow to one quarter of their current width, the economic loss would be about $5 for every individual beach visit, potentially totaling $252,000 over the course of one season (Parsons et al. 2013). In general, public recreational activities are not as well monitored or documented as other ocean uses. More data and information is needed to be able to more fully assess the magnitude of and trends in ocean and coastal recreational uses. 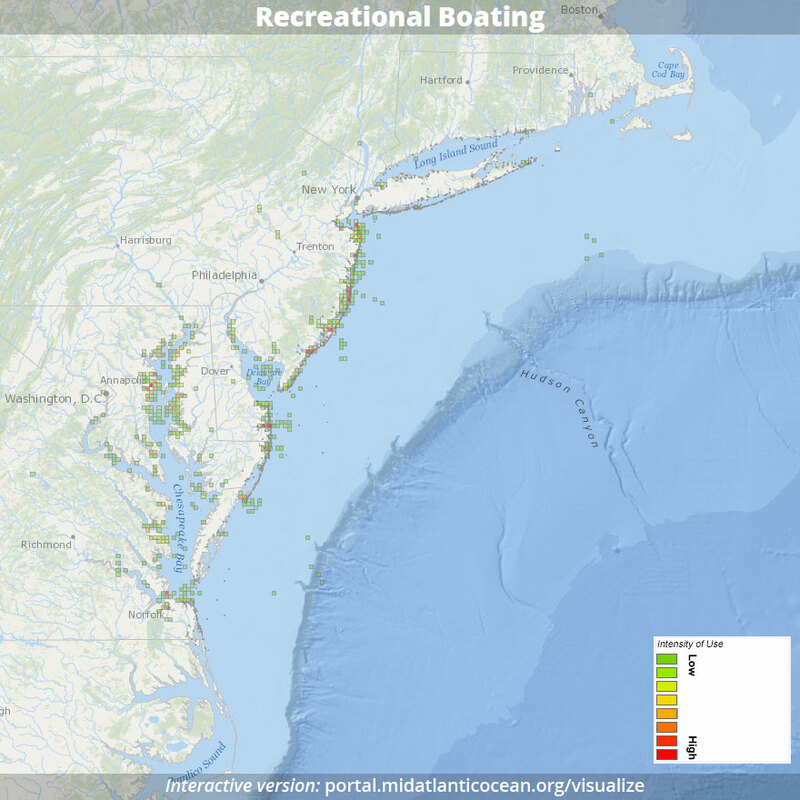 Recreational boating density. For interactive map, go to MARCO Data Portal and click on Recreation > Recreational Boating Survey.